This tutorial will show you step by step how to make your Facebook “mobile uploads” album private in two different ways using a computer and a web browser or using the Facebook application on an Android phone. When you view your Facebook profile as someone else, you will see that your “mobile uploads” album is visible for everybody including people who are not your friends on Facebook (public). This album doesn't have privacy settings and changing the privacy settings for every picture within the album is a lot of work – especially if the album has a lot of photos. You could also move all the pictures to other albums, but this is a lot of extra work. Fortunately, there's an easier and faster way. 4. Click on the ▼ (triangle) icon at the top right and choose Settings. 5. Click on Privacy on the left side. 6. Go to Who can see my stuff. 7. 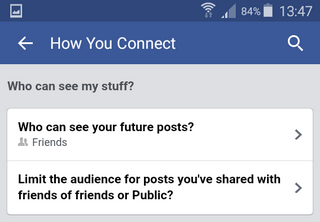 Go to Who can see your future posts and make sure Friends or Only Me is selected. To change this setting, you click on Edit. 8. Go to Limit the audience for posts you've shared with friends of friends or Public? and click on Limit Past Posts. 9. Click on the Limit Old Posts button. 10. Click on Confirm to save the settings. Your “mobile uploads” album is now private. If you want to test and see if your “mobile uploads” album is private and not visible to the public, then go to How to view your Facebook profile and page as someone else or public. 2. Log into your account (if not already logged in). 3. Tap on the menu button (3 horizontal stripes). 4. Scroll down and tap on Account Settings. 6. Tap on Who can see your future posts?. 7. Tap on Friends or Only Me. 8. Tap on Limit the audience for posts you've shared with friends of friends or Public?. 9. Tap on Limit Past Posts. If you want to test and see if your “mobile uploads” album is private and not visible to the public, then go to How to view your Facebook profile and page as someone else or public (Android included).